Not to be confused with Gin no Spoon. Cover of the first volume of Silver Spoon featuring main character Yuugo Hachiken. Silver Spoon (Japanese: 銀の匙, Hepburn: Gin no Saji) is a Japanese coming-of-age manga series written and illustrated by Hiromu Arakawa, serialized in Shogakukan's Weekly Shōnen Sunday since April 2011. The story is set in the fictional Ooezo Agricultural High School in Hokkaido, and depicts the daily life of Yuugo Hachiken, a high school student from Sapporo who enrolled at Ezo fleeing from the demands of his strict father. However, he soon learns that life on an agricultural school is not as easy as he initially believed. Unlike his new classmates, he has no intention of following an agricultural career after graduating, although he envies them for already having set goals for their lives and the pursuit of their dreams. An anime adaptation produced by A-1 Pictures aired two seasons between July and September 2013 and January and March 2014 on Fuji TV's noitaminA block. A live-action film based on the manga produced by Toho was released on March 7, 2014. The manga was well received by its Japanese audience while earning itself awards. After failing to pass the entrance examination for the high school he plans to attend, mild-mannered student Yuugo Hachiken moves away from his suburban lifestyle and enrolls at Ooezo Agricultural High School (大蝦夷農業高等学校, Ōezo Nōgyō Kōtō Gakkō) – often abbreviated as Ezonō (エゾノー, lit. "Ezo Agricultural") – in the countryside. His relationship with his family is strained at the start of the story, which influences his decision to attend a school far from home. He continues to worry about his future career over the course of the series. He soon finds himself slowly getting used to his new environment despite some initial struggles, and grows into an empathetic and compassionate individual as he struggles to understand the world of agriculture and how it affects the lives of his new friends. The main protagonist, Yuugo is a city boy from Sapporo. After failing to pass the entrance exams for the high school he plans to attend, Yuugo decided to enroll at Ezo instead, believing that an easier academic workload would leave him with more time to prepare for college exams. However, the agricultural courses' demand for hard labor proved his assumptions wrong. Due to his strict upbringing by his father, he is unable to refuse when someone needs his help. Despite complaining a lot when he feels that people abuse his generosity, Yuugo quickly earns the friendship and respect of his peers for his intellect and hardworking nature. Shortly after enrolling, Yuugo joins the Equestrian Club alongside his classmate Aki, soon rising to the position of Vice President of the club due to his reliable nature. Yuugo is usually anxious about his future as, unlike his classmates who already have set their goals in life, he is still wondering about what career he should choose. Much of Yuugo's animosity towards his family is a result of being compared to his more successful older brother, Shingo, and the seemingly uncaring hostility of his father. He has a crush on Aki and they officially start dating after Aki got accepted into university. Aki is a first-year student who is also a member of the Equestrian Club. As the only child of her family, she entered Ezo to study so that she would inherit her family business, a cow and horse farm specializing in raising Ban'ei race horses. Her father is very protective and is wary of her relationship with Yuugo at first; however, after some time, she starts seeing him as a man worthy of becoming her husband, though still having qualms when they start dating. She keeps her desires bottled up and is friendly and seems easygoing, but in reality pushes people away from her problems. She has poor grades nearly comparable to Tokiwa. Later, her family experiences financial difficulties and is forced to sell all their horses to make ends meet. After this event, Aki confesses her true desires for the future, and – encouraged by Yuugo – expresses her will to work with horses professionally instead of inheriting the farm. She then starts studying to enter college with Yuugo as her personal tutor. She slowly develops feelings for Yuugo and they officially start dating after she got accepted into university. A classmate of Yuugo. She is a member of the Dairy Farming program. Her dream is to open her own cheese factory. One of Yuugo's close friends at Ezo and a skilled baseball player, Ichiro is Aki's childhood friend and neighbor; their closeness was initially a constant source of jealousy for Yuugo. Ichiro's family owns a small dairy farm, which he manages with his mother and younger twin sisters. Ichiro dreams of becoming a professional baseball player so he can use the money he earns in the league to improve his family's farm. However, his family goes bankrupt and their farm is sold to pay their debt. As a result, he is forced to quit Ezo and look for a job to make ends meet and support his mother and sisters. Another close friend of Yuugo, Shinnosuke aims to become a veterinarian after graduation. His goal, however, is complicated by his tendency to faint at the sight of blood. He is a member of the Holstein Club. A wealthy classmate of Yuugo whose family runs a huge industrial farm. She is usually an obese girl, but under the extra fat she hides a quite beautiful figure that reveals itself occasionally when she works too hard or goes on a quick diet. However, she feels too weak when she is thinner, and usually quickly regains the weight. Obsessed with money, Tamako's goal is to take over her family's farm (humorously depicted as a "hostile takeover" by her parents), and expand it and make it more profitable. A close friend of Yuugo who has a talent of getting himself in trouble due to his difficulty studying and his habit of jumping to conclusions, much to his friends' chagrin. His family owns a chicken farm. A close friend of Yuugo who is a huge otaku with a complete collection of figurines, manga and posters and is good at otaku art. He is sensible and mature for his age and often gives Yuugo good advice. He cares for his friends and is very intelligent, knowing and explaining a lot about the crops and their economic value. He is also very knowledgeable about technology. He hopes to attend a college of university in Tokyo, mainly because, as he claims, Tokyo is the land of otaku. An aristocratic girl to a vast agriculture fortune and childhood rival to Aki Mikage. She often gets Hachiken's name wrong by replacing the Hachi (8) part of his name with different numbers, calling him "Shichiken" (7) and "Jūhachiken" (18). A first year student and Yuugo's roommate. He will often help out Yuugo, such as the doing the chores he forgot about. He's in the Food Sciences program. Yuugo's older brother who managed to get accepted to the University of Tokyo, the most prestigious university in Japan. However, Shingo later quit once he realized his father's dream was to have one of his sons accepted there. He decides to pursue his own dream of becoming a great cook, and travels the country to perfect his cooking skills, often with humorously questionable results. He often drops by Ezo unannounced to check on Yuugo, since Yuugo usually refuses to talk with his family. Shingo is carefree and outgoing which is often a source of animosity from Yuugo, but he becomes a little more responsible after marrying Alexandra, a young Russian girl he meets during his travels. After the completion of her successful fantasy series Fullmetal Alchemist, author Hiromu Arakawa and her publisher Shogakukan agreed that she should begin the more realistic Silver Spoon as a way to challenge herself as a manga artist and recruit new readers. Having grown up in a rural setting, many elements of the manga are drawn from Arakawa's experiences in her youth. For instance, characters such as the piggery teacher Ichiko Fuji and members of the Holstein fanclub are based on individuals she knew in her high school. 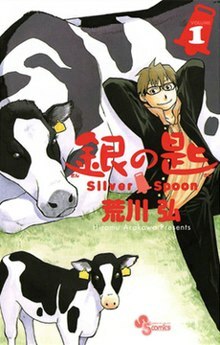 Though the story contains matters like the protagonist Yuugo Hachiken's ethical dilemma over animal slaughter, Arakawa insists Silver Spoon is not a "green" manga. She states that she simply wants to tell the story of a high schooler's maturation, similar to how Fullmetal Alchemist focuses on the development of the main character Edward Elric rather than promoting alchemy. Silver Spoon began its publication in Weekly Shōnen Sunday on April 6, 2011. It was serialized regularly until August 2014 when Arakawa announced she would slow the pace of producing new chapters of the manga so that she could care for a family member in declining health. After an eight-month hiatus, the manga briefly resumed in April 2015 until another short hiatus was announced the following month. After the release of the manga's 13th volume, the author announced its "imminent" conclusion. She later explained that she had originally planned to depict Yuugo's first year at Ooezo in detail, followed by rushed second year and shortened third year, and his eventual life after graduation. In 2016, new chapters were published from January to February and August to September. The manga went on hiatus in July 2017, after three chapters were published. Four new chapters were published between May and June 2018. Influenced by Arakawa's own life experience, as she was raised in a dairy farm in Hokkaido, Silver Spoon was launched in the 19th issue of Shogakukan's Weekly Shōnen Sunday magazine on April 6, featured on the cover. It became one of the magazine's main features not long after. The individual chapters have been compiled by Shogakukan in 14 tankōbon as of August 2017. The manga has been licensed for English-language release in Singapore by Shogakukan Asia, while in North America, Yen Press announced the acquisition of the manga in July 2017 and published the first volume on February 27, 2018. These chapters have yet to be published in a tankōbon volume. They were originally serialized in Japanese in Weekly Shōnen Sunday from July 2017 to June 2018. An anime television series produced by A-1 Pictures aired from July 11, 2013 to September 19, 2013. Tomohiko Itō directed the series with assistant director Kotomi Deai. Taku Kishimoto wrote the scripts, while Jun Nakai served as character designer and chief animation director, and Shusei Murai scored the music. A second season aired from January 9, 2014 to March 27, 2014. For the first season, the opening theme is "Kiss you" by miwa, while the ending theme is "Hello Especially" by Sukima Switch. For the second season, the opening theme is "Life" by Fujifabric and the ending theme is "Oto no Naru Hō e" by Goose House. The anime has been licensed by Aniplex of America for streaming and home video in North America. Aniplex of America released the first season on DVD on July 15, 2014. Running away from home, Yuugo Hachiken leaves the urban life at Sapporo to enroll at the Ōezo Agricultural High School and it does not take long for him to learn that adapting himself to his new environment will not be easy. Getting used to his new environment, Hachiken must enroll at one of the school clubs according to the curriculum, and encouraged by his classmate Aki Mikage, he ends up joining her at the equestrian club. However, he spends the day doing menial tasks like cleaning the stables and just when he is starting to regret his decision, he is invited to experience the joy of riding a horse for the first time. With most of the students on leave at Golden Week, Hachiken, Mikage and their classmate Ichiro Komaba watch a Ban'ei horse race together, and despite the horse bred at Mikage's farm do not win, she gets some relief learning that he gets well placed enough to have a chance of not being killed for livestock. After returning to the school, Hachiken pities a piglet that is the weakest and smallest among its siblings and giving it the nickname "Pork-Bowl" decides to take care of it, just to later know that it will be sent to the slaughterhouse in three months. While on cleaning duty, Hachiken stumbles on an abandoned oven and his classmates convince him to make pizza with it, as most of them never ate one before. As Hachiken and his friends gather the necessary supplies throughout the campus, a teacher from his old school in Sapporo drops at Ezo to check on him. The boys take heed of a certain special event to be held at night and come with a plan to slip past curfew to get a glimpse of it. Having no idea about what is it or why his classmates are so pumped up with it, Hachiken ends up dragged along in their scheme. "Hachiken Goes to Stay With the Mikages"
Hachiken learns that the dorms will be closed for summer vacation but refusing to return home, he accepts Mikage's offer to work at her family's farm. However, once realizing that he has not warned his parents about it, he looks for a place with cellphone signal until he gets lost and is rescued by Komaba. Hachiken and Mikage take a break from work and pay a visit to Giga Farm, a huge industrial farm that belongs to their classmate Tamako Inada's family. In the occasion, Hachiken learns about the rather harsh reality of the animals living there and realizes Mikage's worries about her family's expectations for her future. "Hachiken Makes a Huge Mistake"
Hachiken's older brother Shingo pays a visit at the Mikage farm to check on him, much to his young brother's chagrin. Just as his part-time job is about to finish, Hachiken's carelessness leads to damage to the farm. Wanting to take responsibility for the accident, he refuses to be paid for his work. However, he is convinced by the Mikages to accept payment as they consider that all the help he provided them during these three weeks were worth it, despite what happened. "Hachiken Hesitates Over Pork Bowl"
Back from summer break, Hachiken learns that Pork-Bowl has not grown as much as its peers and takes extra measures to ensure that it gains weight faster, even knowing that this will make things even more painful for him when the time comes to part with it. "Hachiken Says Goodbye to Pork Bowl"
The time has come for Pork-Bowl to be sent to the slaughterhouse and Hachiken decides to make use of the money he earned during summer vacation to buy all its meat. After the meat is delivered to him, Hachiken's friends come with several ideas about what to do with it. The bacon Hachiken prepared with Pork-Bowl's meat becomes a fad among the students and it does not take long for it to run out. As Komaba plays in the local baseball team aiming for the nationals, his friends come to the stadium to cheer for him and Hachiken realizes that six months has passed since he enrolled in Ezo Agricultural and unlike his friends, he still has not decided what path he should take in life. "Hachiken Becomes the Club Vice President"
The seniors from the Equestrian Club appoint Hachiken as the new vice-president against his will. Troubled about it, he later witnesses Mikage crying after having a serious conversation with Komaba and can't stop worrying about them as well, even after they tell him to forget about it. Hachiken finds an abandoned puppy during cleaning and decides to adopt it. However, taking care of his new pet is not an easy task, as he not only needs money for vaccines and registration, but has to train it. The newbies from the Equestrian Club have their first jump class, but Hachiken is the only one who fails to have his horse jump an obstacle, bringing some unpleasant memories of his past to surface. Claiming that it needs more than words to have him figure out the reason why, Mikage takes him to a jumping competition. Hachiken participates in his first official jumping competition. In the occasion he and Mikage have a short meeting with Ayame Minamikujō, Mikage's childhood friend and self-proclaimed rival, and is startled when meeting his brother again by surprise. "Hachiken Has His Hands Full"
With the Ezo Agricultural Festival fast approaching, the Equestrian Club begins work on Ban'ei horse racing track, despite Hachiken tasking himself with way too much work. Afterwards Hachiken takes initiative and asks Mikage out on a date and his feelings for her are revealed by her friends. However, on the morning of the festival, Hachiken suddenly collapses on the race track. "Mikage Gives It Her All"
Hachiken wakes up at the hospital and comes face to face with his father, who wastes no time blaming the Ezo Agricultural institution for Hachiken's fatigue. Meanwhile, Mikage and the Equestrian Club work their hardest to make the festival a success and praise Hachiken for all his hard work upon his return. "Komaba Stands on the Pitcher's Mound"
The time has come for the Regional Baseball Championship and the students cheer for Ezo Agricultural's team, hoping for them to reach the National tournament, specially for Komaba who is one of the team's highlights. Hachiken discovers that Komaba has lost not only the Championship, but the last chance for him to settle the debts of his farm and is forced to quit school and look for a job to help at home. Despite knowing that there is not anything he can do about it, Hachiken can't bear to accept the fact that Komaba was forced to give up on his ambitions before he could even get the chance to fight for them. Despite knowing that there is nothing he could do for Komaba's sake, Hachiken claims to Mikage that it is fine for them to rely on him and they pay a visit at Komaba's farm to pay their respects as all their cows are seized to pay for their debt. However, Mikage's farm is also in difficulties and when they are forced to sell all their horses, she comes with an important decision with Hachiken's support. Determined to follow her dream of working with horses, Mikage is allowed to work under her uncle instead of inheriting her father's farm under the condition of making into college and Hachiken agrees to help her. Hachiken returns home to Sapporo to obtain his brother's study guides for Mikage and has a frustratingly insightful encounter with his father. Afterwards Hachiken's mother visits Ezo Agricultural to better understand the school he choose and leaves knowing that he is growing into a better person. Finally, as the winter season approaches, Hachiken and his friends begin planning their respective futures. A live-action film based on the manga of the same name was officially announced in the Nikkan Sports and Sports Nippon newspapers on August 7, 2013. Kento Nakajima played Yuugo Hachiken, with Alice Hirose as Aki Mikage and Tomohiro Ichikawa as Ichiro Komaba. The film was directed by Keisuke Yoshida, with the production companies TBS and Wilco and the distributor Toho. Gin no Saji premiered in Tokyo on March 7, 2014, and was also shown at the Japan Film Festival of San Francisco on July 22, 2014. The film's theme song was "Hidamari", performed by Yuzu. Iwasawa Koji wrote and composed the song just for the movie. Since its first volume, Silver Spoon had been well received by readers. It became the fastest Shogakukan title to reach the mark of one million first printing copies, a year and three months after the manga was launched. According to Oricon, it was also the 7th best-selling manga in Japan in 2012, and the top selling title from Shogakukan, as well as the top selling title of 2012 not yet to have an anime adaption. By October 2013 it has sold 12 million copies in Japan. As of 2014 the series has sold over 15 million copies in Japan. As of July, 2017, the manga had over 16 million copies in print. In 2012, Silver Spoon won the 5th Manga Taishō Award's Grand Prize  and the 58th Shogakukan Manga Award (shōnen category) in 2013. In 2013 Silver Spoon won the first Japan Food Culture Contents Award. In February 2015, Asahi Shimbun announced that Silver Spoon was one of nine nominees for the nineteenth annual Tezuka Osamu Cultural Prize. ^ "Silver Spoon Sub.DVD - Review". Anime News Network. Archived from the original on 2014-07-30. Retrieved 2014-07-30. ^ Silverman, Rebecca (February 21, 2018). "Silver Spoon GN 1 - Review". Anime News Network. Retrieved July 28, 2018. ^ a b c d e f g h i j Hodgkins, Crystalyn (May 23, 2015). 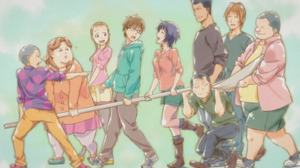 "Silver Spoon Anime's Cast Revealed, 2 Ads Posted". Anime News Network. Retrieved April 7, 2019. ^ Komatsu, Mikikazu (December 7, 2013). "Sayuri Yahagi Joins "Silver Spoon" Anime 2nd Season as Ayame Minamikujyou". Crunchyroll. Retrieved April 7, 2019. ^ a b c Fallaix, Olivier (March 5, 2013). "Interview: Hiromu Arakawa". AnimeLand (in French). No. 189. Paris, France: Anime Manga Press. ISSN 1148-0807. ^ ANN staff (March 25, 2011). "FMA's Hiromu Arakawa Starts Silver Spoon School Manga". Anime News Network. Archived from the original on June 15, 2017. Retrieved 2017-07-23. ^ Nelkin, Sarah (August 2, 2014). "Silver Spoon's Arakawa Slows Manga's Serialization". Anime News Network. Retrieved February 19, 2019. ^ Hodgkins, Crystalyn (April 5, 2015). "Hiromu Arakawa's Silver Spoon Manga Returns This Month". Anime News Network. Retrieved February 19, 2019. ^ Hodgkins, Crystalyn (May 11, 2015). "Hiromu Arakawa's Silver Spoon Manga Goes on Short Hiatus". Anime News Network. Retrieved July 23, 2017. ^ ANN staff (May 27, 2017). "Arakawa: Silver Spoon Manga Will Show Hachiken After Graduation". Anime News Network. Archived from the original on June 25, 2017. Retrieved 2017-07-23. ^ Ressler, Karen (November 25, 2015). "Hiromu Arakawa's Silver Spoon Manga Returns in January". Anime News Network. Retrieved February 19, 2019. ^ Loo, Egan (August 23, 2016). "Silver Spoon Manga Will Resume on August 31". Anime News Network. Retrieved February 19, 2019. ^ Sherman, Jennifer (September 20, 2016). "Silver Spoon Manga Goes Back on Hiatus". Anime News Network. Retrieved February 19, 2019. ^ Sherman, Jennifer (June 23, 2017). "Hiromu Arakawa's Silver Spoon Manga Returns on July 5". Anime News Network. Retrieved February 19, 2019. ^ Ressler, Karen (July 18, 2017). "Silver Spoon Manga Goes Back on Hiatus After 3 Chapters". Anime News Network. Retrieved February 19, 2019. ^ Pineda, Rafael Antonio (May 24, 2018). "Silver Spoon Manga Gets Another New Chapter on May 30". Anime News Network. Retrieved February 19, 2019. ^ Sherman, Jennifer (June 12, 2018). "Silver Spoon Manga Goes Back on Hiatus After 4 Chapters". Anime News Network. Retrieved February 19, 2019. ^ "FMA's Hiromu Arakawa Starts Silver Spoon School Manga - News". Anime News Network. March 25, 2011. Archived from the original on 2011-09-29. Retrieved January 26, 2012. ^ a b 銀の匙 14 (in Japanese). Shogakukan. Retrieved June 6, 2018. ^ "Silver Spoon 1". Shogakukan Asia. Archived from the original on June 3, 2015. Retrieved April 7, 2019. ^ "Yen Press Licenses Silver Spoon, Kemono Friends Manga, Imōto Sae Ireba Ii., Reborn as a Vending Machine Light Novels, More". Anime News Network. July 2, 2017. Retrieved July 2, 2017. ^ a b "Silver Spoon, Vol. 1". Yen Press. Retrieved June 6, 2018. ^ 銀の匙 1 (in Japanese). Shogakukan. Archived from the original on February 24, 2013. Retrieved September 16, 2012. ^ 銀の匙 2 (in Japanese). Shogakukan. Archived from the original on January 7, 2013. Retrieved September 16, 2012. ^ "Silver Spoon, Vol. 2". Yen Press. Retrieved June 6, 2018. ^ 銀の匙 3 (in Japanese). Shogakukan. Archived from the original on January 7, 2013. Retrieved September 16, 2012. ^ "Silver Spoon, Vol. 3". Yen Press. Retrieved June 6, 2018. ^ 銀の匙 4 (in Japanese). Shogakukan. Archived from the original on February 20, 2013. Retrieved September 16, 2012. ^ "Silver Spoon, Vol. 4". Yen Press. Retrieved June 6, 2018. ^ 銀の匙 5 (in Japanese). Shogakukan. Archived from the original on February 18, 2013. Retrieved September 16, 2012. ^ "Silver Spoon, Vol. 5". Yen Press. Retrieved June 6, 2018. ^ 銀の匙 6 (in Japanese). Shogakukan. Archived from the original on January 23, 2013. Retrieved January 26, 2013. ^ "Silver Spoon, Vol. 6". Yen Press. Retrieved June 6, 2018. ^ 銀の匙 7 (in Japanese). Shogakukan. Archived from the original on April 20, 2013. Retrieved April 17, 2013. ^ "Silver Spoon, Vol. 7". Yen Press. Retrieved June 6, 2018. ^ 銀の匙 8 (in Japanese). Shogakukan. Archived from the original on June 22, 2013. Retrieved May 23, 2013. ^ 銀の匙 9 (in Japanese). Shogakukan. Archived from the original on October 5, 2013. Retrieved November 11, 2013. ^ 銀の匙 10 (in Japanese). Shogakukan. Archived from the original on January 5, 2014. Retrieved November 11, 2013. ^ 銀の匙 11 (in Japanese). Shogakukan. Archived from the original on January 25, 2014. Retrieved November 11, 2013. ^ 銀の匙 12 (in Japanese). Shogakukan. Archived from the original on August 5, 2014. Retrieved September 15, 2014. ^ 銀の匙 13 (in Japanese). Shogakukan. Retrieved June 6, 2018. ^ "Hiromu Arakawa's Silver Spoon Manga Gets TV Anime". Anime News Network. 2012-12-28. Archived from the original on 2012-12-31. Retrieved 2012-12-28. ^ "Galileo Donna Anime by Kite's Umetsu to Air on Noitamina". Anime News Network. 2013-07-05. Archived from the original on 2013-07-08. Retrieved 2013-07-05. ^ "2nd Silver Spoon Season's January 9 Date, Staff Unveiled". Anime News Network. 2013-12-01. Archived from the original on 2014-02-05. Retrieved 2014-02-01. ^ "New Silver Spoon TV Ad Previews miwa, Sukima Switch's Theme Songs". Anime News Network. June 13, 2013. Archived from the original on June 16, 2013. ^ "Rock Band Fujifabric Performs 2nd Silver Spoon Opening". Anime News Network. November 27, 2013. Archived from the original on April 1, 2014. ^ "Aniplex USA Offers 1st, 2nd Madoka Magica Films Dubbed, AnoHana Film Blu-ray/DVD". Anime News Network. 2014-05-24. Archived from the original on 2014-05-25. ^ "第1回　2013年7月11日(木)放送　あらすじ" (in Japanese). Fuji TV. Retrieved April 7, 2019. ^ "第2回　2013年7月18日(木)放送　あらすじ" (in Japanese). Fuji TV. Retrieved April 7, 2019. ^ "第3回　2013年7月25日(木)放送　あらすじ" (in Japanese). Fuji TV. Retrieved April 7, 2019. ^ "第4回　2013年8月1日(木)放送　あらすじ" (in Japanese). Fuji TV. Retrieved April 7, 2019. ^ "第5回　2013年8月8日(木)放送　あらすじ" (in Japanese). Fuji TV. Retrieved April 7, 2019. ^ "第6回　2013年8月15日(木)放送　あらすじ" (in Japanese). Fuji TV. Retrieved April 7, 2019. ^ "第7回　2013年8月22日(木)放送　あらすじ" (in Japanese). Fuji TV. Retrieved April 7, 2019. ^ "第8回　2013年8月29日(木)放送　あらすじ" (in Japanese). Fuji TV. Retrieved April 7, 2019. ^ "第9回　2013年9月5日(木)放送　あらすじ" (in Japanese). Fuji TV. Retrieved April 7, 2019. ^ "第10回　2013年9月12日(木)放送　あらすじ" (in Japanese). Fuji TV. Retrieved April 7, 2019. ^ "第11回　2013年9月19日(木)放送　あらすじ" (in Japanese). Fuji TV. Retrieved April 7, 2019. ^ "Kento Nakajima Stars in Live-Action Silver Spoon Film". Anime News Network. August 6, 2013. Archived from the original on February 8, 2017. Retrieved March 12, 2017. ^ a b c "Yuzu to provide the theme song for 'Silver Spoon' live-action film". Tokyohive.com. December 6, 2013. Archived from the original on March 9, 2014. Retrieved January 14, 2015. ^ "Silver Spoon". Japan Film Festival of San Francisco. Archived from the original on April 3, 2015. Retrieved January 14, 2015. ^ "Silver Spoon Is Shogakukan's Fastest With 1-Million 1st Printing". Anime News Network. July 11, 2012. Archived from the original on July 14, 2012. ^ "30 Top-Selling Manga in Japan by Series: 2012". Anime News Network. December 2, 2012. Archived from the original on June 18, 2013. ^ "Live-Action Silver Spoon Film's Teaser Streamed". Anime News Network. October 26, 2013. Archived from the original on October 27, 2013. ^ "Silver Spoon （1-12 volumes）". Sugoi Japan Award. Archived from the original on October 1, 2016. Retrieved October 1, 2016. ^ "Hiromu Arakawa's Silver Spoon Wins 5th Manga Taisho Award". Anime News Network. March 23, 2012. Archived from the original on December 16, 2014. ^ "Silver Spoon, I Am a Hero Win Shogakukan Manga Awards". Anime News Network. March 10, 2013. Archived from the original on March 1, 2013. ^ "Silver Spoon Manga Wins Japan Food Culture Contents Award - News". Anime News Network. 2013-12-12. Archived from the original on 2014-02-20. Retrieved 2014-07-30. ^ "19th Tezuka Osamu Cultural Prize Nominees Announced". Anime News Network. 23 March 2015. Archived from the original on 22 March 2015. Retrieved 24 March 2015.